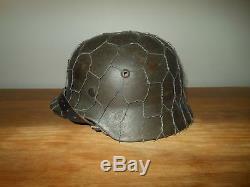 The first "modern" steel helmets were introduced by the French army in early 1915. The German army began tests for their own steel helmet at the Kummersdorf Proving Grounds in November, and in the field in December 1915, experimenting with both captured French and British helmets. An acceptable pattern was developed and approved and production began at Eisen-und Hüttenwerke, AG Thale/Harz, in the spring of 1916. In 1935, the Third Reich developed the smaller, lighter M35 style helmet, and then in an effort to reduce construction time and labor costs, minor modifications were introduced in March 1940 resulting in the M40 helmet. 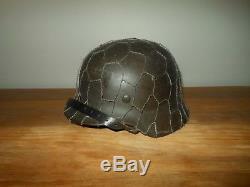 Further construction modifications were undertaken in August 1942 resulting in the M42 helmet. 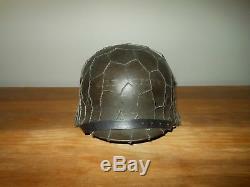 Made of stamped steel, this M435 Combat Helmet is in AMAZING condition! It retains 95% of it's original paint and finish, with some slight scratches, wear, dents, marks, and corrosion, due to the age. 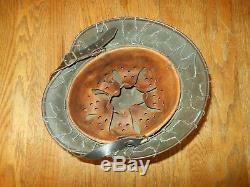 It appears to have a mixture of dark grey and green, but it is hard due to the overall patina. Markings indicate ET62, as well as the serial number. 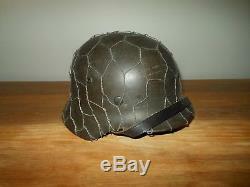 The helmet band and liner are both ORIGINAL to this helmet, and have not been added post-war. Appears that there was some masking tape on the forehead area that has come away, leaving a mark (the veteran probably wrote where he got it from). 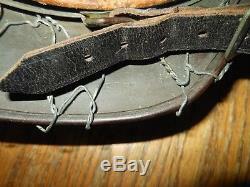 The chinstrap is original and is maker marked. The chicken wire is the original European type... But was added post-war by a collector. A PERFECT item for any collection or display. 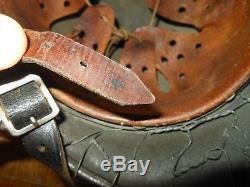 Most of my items are vintage, and as such are AS-IS, so you must therefore expect a degree of wear due to age and/or usage. Although my passion is the Me109, I do offer many other German Aircraft Fw190, Me262, etc. 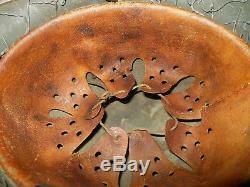 , as well as USAF and Japanese items. Occasionally I do offer many non-vintage items such as prints and art relating to the time period. Use is solely based on my authorization only. 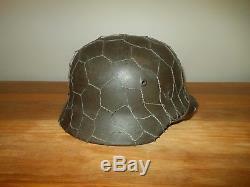 The item "WW2 German Heer M35 Combat Helmet VET BRING-BACK 100% ORIGINAL NICE" is in sale since Thursday, August 30, 2018. 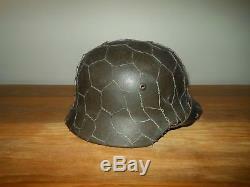 This item is in the category "Collectibles\Militaria\WW II (1939-45)\Original Period Items\Germany\Hats & Helmets". 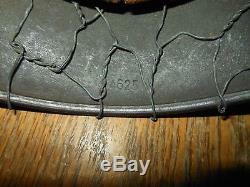 The seller is "messerschmitt*109" and is located in Agoura Hills, California.